Is it really Thursday all ready? My sense of time seems to be a bit out of step with the days this first full week of the new year. I'm hoping that it doesn't race too quickly to Valentine's Day! Stacey and I have set and shaken on a goal of finishing Chart 1 of Icarus by February 14. There's nothing (material) wagered, we're just setting a first step goal so that we can enjoy wearing our Icarus shawls, which others have completed in the Knitting with Nora KAL. Although Stacey made our goal public by blogging about it yesterday so there's just a bit more pressure. Little minx. That's fine really. I do very much want to finish this shawl and if this works, I'm happy. As of this moment, I have 105 more rows to go in Chart 1 with 37 days remaining. It seems very a reasonable goal with some time management and skillful packing for my trip to the east coast next week. It is probably about time for me to throw a lifeline into my knitting to thwart Murphy. What do you think? Do you have any hints for fitting lace knitting into your day? Yesterday, I finally realized the dull headache I experienced all vacation was not stress-related. In fact, my sinuses have been trying to tell me they need attention and I almost left it too late. I found (and used) the Mucinex in the medicine drawer and drank more warm liquids, besides adding hot sauce to my lunchtime noodle soup. This morning, I do feel better and I expect continued progress, now that I've clued into my body a bit. Flying next week would have been no fun if I hadn't had the light-bulb moment. The renovations have started. Here is the sunroom with the moat and a regular occupant. The red bordered photo displays poison ivy.....a rather frequent volunteer plant at Chez Purling Oaks. The moat received its name on the day we inspected the house with our inspector in the month of February about 3 or so years ago. Little did we know it would really become a moat this year with water streaming down the glass and squishing back into the house. However, as of today, the moat is no more! This morning I went to Curves. It was good. I also worked and then went to visit the dentist for my six-month cleaning and check-up. I had a great check-up! About five months ago I purchased an Oral-B Triumph electric/cordless toothbrush and I've been using it consistently. My dental hygienist said my teeth looked like they had been whitened. Plus, my gums were super healthy. They were healthy before but now they are super healthy. So, if you are on the fence about one of these fancy toothbrushes, you can leap down now and run over to the market and feel good about your purchase. I am not receiving any compensation for this plug. It is just a good thing and I think it shouldn't be a secret. I'm experimenting with the Diva Cup this week and I'm having a great experience. I read about the Diva Cup at Enchanting Juno's blog, where she has written several super posts about menstruation and related issues--read the comments to the posts, too, if you haven't all ready. The Diva Cup isn't hard to get used to and it is handling my heavy flow easily. Where I would be changing a pad and tampon hourly, I only have to deal with the cup every four hours. I find it pretty interesting to actually measure the volume of my flow. It feels better than tampons, too. It was about $25 or maybe a bit more at Whole Foods Market and it was worth it. It is making me more confident that I won't have an *accident* at work, and in a place far away from home at that. First things first: Dad got some sleep last night and felt alot better this morning so he went home from the hospital this afternoon to sleep (actually, he used the word "crash") in his own bed. I spoke with him just before dinner and he was really enjoying a glass of beer. We won't be able to get the results from the tests for several days, so I'm just thinking positive thoughts. Dad's able to breathe better and is happy at home. All good things. To remedy my current winter skin malady, I will mix about a half cup (maybe a bit more) of sugar with several tablespoons of apricot kernel oil--enough oil to saturate the sugar--and, maybe, a drop or two of lavender essential oil. The essential oil is not, well, essential. Definitely go light on it if you add it because a drop will go a long way. 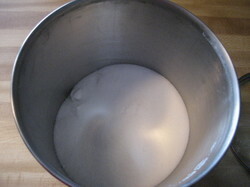 Then I hop in the shower, get wet, then rub the sugar concoction all over and rinse. Be careful if you do your feet because the oil will make them slippery. Then I soap up my essential bits, shampoo, rinse, and towel off. In my current state, I'll have to do this for two days to achieve complete recovery. 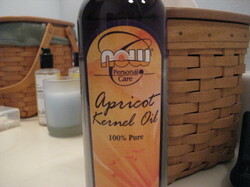 Then I just use a few drops of apricot kernel oil before I step out of the shower to keep my skin moisturized. I try to repeat the sugar scrub once or twice a week when the weather is this cold. I like apricot kernel oil but there are different kinds like almond or avocado or even olive oil....it just depends on your preference and skin type. You can substitute salt for the sugar, if you want, but if you have ANY cuts it will sting, sting, sting! I think this routine is healthy (no weird additives), pretty darn inexpensive compared to what you can buy at Target or the drug store, and quite effective (if you remember to DO IT!). Sonnet: I've made my way to the back but not too far on the back so you really would not see any progress in a new photo. Bath to Tub Conversion: This evening DH and I talked with a representative for a firm that will replace our at-the-end-of-useful-life basement bathroom fiberglass BLUE tub with a nice shower with all the fixings. This is our first bid and this guy's number$ just made me sit back in my chair. Looks like I'll be doing some cost comparison shopping this weekend to see if the fancy-pants shower is worth it.